After purchasing this product, you will be sent a unique Kogan Mobile vouchers by email within 24 hours and a Kogan Mobile SIM Starter Pack by post. If you are activating a new Kogan Mobile service, visit the activation centre to redeem a voucher. If you are already a Kogan Mobile Broadband customer, simply login to your account and use your voucher to recharge. Each voucher can be redeemed for an Data M – 30 Day Plan without any additional charge. Switching to Kogan Mobile is quick and easy in just a few steps. For peace of mind, you can even set up ‘auto renew’ to ensure you’re never caught without data. A compatible device is required to use this plan. Click here for more information about compatible devices or to buy a compatible device. 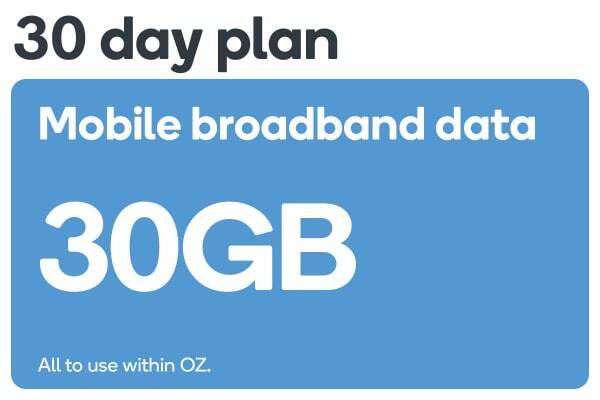 Please note: this is a standalone mobile broadband plan and cannot be used to top up an existing Kogan Mobile phone service. The unique Kogan Mobile voucher included as part of this product is non transferrable and cannot be redeemed for cash. Voucher expires at 11:59pm AEDT on 31/12/2019. Activation must be made before the voucher expiry date. Voucher does not apply to subsequent recharges. Voucher cannot be used in conjunction with any other vouchers or promotional offers. For information about how to use Kogan Mobile vouchers, click here. Not for commercial or resale purposes. For use in Australia. You must order a free Kogan Mobile SIM from kogan.com before purchase of a Prepaid Plan. Once your SIM is delivered you can buy and activate your Prepaid Plan. Data sessions rounded to the nearest KB. Once data inclusion is exhausted, you will need to purchase another data plan or recharge to continue using data. Unused data expires on next recharge, the beginning of the next 30 day block or expiry date of the recharge, whichever is earlier. For 30 Day Plans: data expires after 30 days or upon next recharge, whichever occurs first. 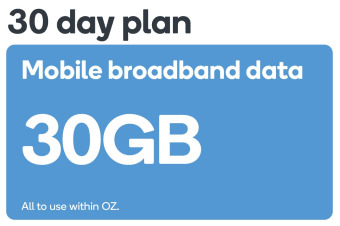 For 365 Day Plans: comes with up to 98,304MB (DATA S – 365 DAYS plan) 368,640MB (DATA M – 365 DAYS Plan). Total Data, in each case split into 30 day blocks as per prepaid plan table from days 1 – 360. From days 361 – 365, 1365 MB (DATA S – 365 DAYS Plan), 5120 MB (DATA M – 365 DAYS Plan) will be added to the account. 1GB = 1024MB. If Data Per 30 Days amount is exhausted before 30 days has elapsed, access to data will cease until the beginning of the next 30 day block (if any), or the customer recharges or purchases another data plan. Vodafone reserves the right to limit speeds to 12Mbps. T&Cs and Fair Use Policy apply. Experience crystal clear reception through the Vodafone 4G network. Browse, socialise and stream with complete freedom thanks to a huge 30GB of data.